WMATA's project to inspect and repair Metrorail tracks, Safetrack, will continue through the rest of this year and into next. Surge #8 started on August 27 and will continue through September 11. Service delays will impact both the Yellow and Blue lines between the Franconia-Springfield and Van Dorn Street stations. 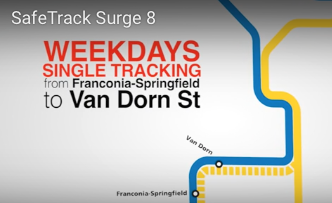 According to WMATA's Surge #8 page there will be continuous single-tracking between the two stations during that period, and NO weekend service. Free shuttle bus service will be provided on the weekends. There are a couple of routes that bicyclists can use. Google Maps bicycle directions between Franconia-Springfield and Van Dorn St is a 4.2 mile route. Cyclists could then park at Van Dorn St and take Metro from there. Cyclists could also ride an 8.5 mile route between Franconia-Springfield and King St station.